Flynet Dashboard Server allows you to create highly visual and interactive dashboards quickly and easily. These can then be used to monitor your Key performance, risk and success indicators.Flynet Dashboard Server provides you with the means to surface data from all of your systems. This can include any ODBC source, scores of other native connectors and Flynet Only connections for heritage environments like Mainframe, iSeries, Unix, VMS and Multivalue. Providing a single view of your business from any device and from any location. Flynet Dashboard Server allows you to create highly visual and interactive dashboards to monitor your Key performance, risk and success indicators. Flynet Dashboard Server provides you with the means to surface data from all of your systems. This can include any ODBC source, scores of other native connectors and Flynet Only connections for heritage environments like Mainframe, iSeries, Unix, VMS and Multivalue. Providing a single view of your business from any device and from any location. What makes Flynet Dashboard Server unique is the ability to surface real-time data from your heritage environment and combine this with key data from other systems to provide both operational specific time to target and or on/off budget views to more holistic departmental or organisation wide views that encompass a number of metrics to provide broader understanding. Flynet Dashboard Server excels in environments where high volume real time transactional data isn’t transparent, for example providing large retail organisations with real time EPOS data, providing utilities suppliers with real time supply and consumption data, providing banking and insurance organisations with positional and customer trend data and providing manufacturers with real time throughput data. These are just a few examples of how Flynet Dashboard Server can be used to aid organisations at the operational level with embedded analytics that can influence outcomes in real-time rather than the traditional Business Intelligence approach that allows you to reflect on data after events have occurred. Using our WYSIWYG SQL browser Flynet Dashboard Server can sit on top of any traditional BI stack to present Key performance, risk and success data in a graphically stunning format making it transparent for users and consumers of the data to quickly ascertain and understand exception case and trending activities within their business. 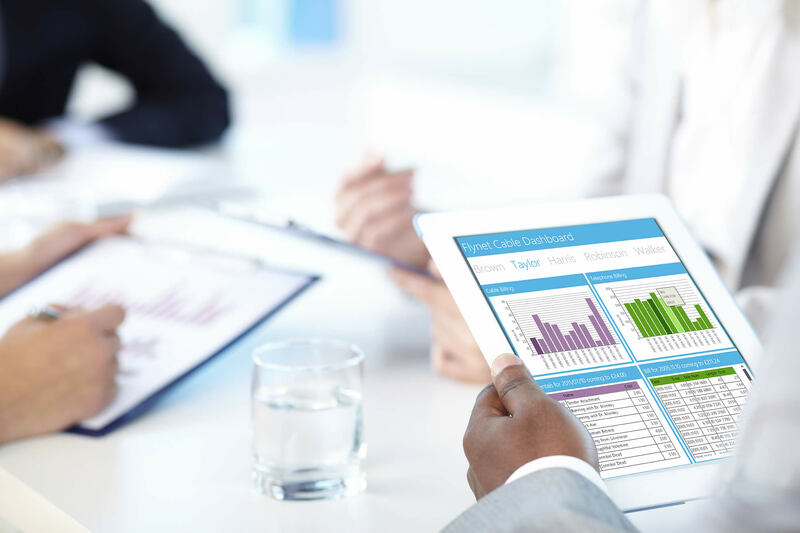 How can Operational and Embedded analytics (real-time analytics) help my organisation? A recent retail example provides a good narrative to drive general understanding around operational and embedded analytics. A large high street store is often broken down into departments, e.g. food, clothing, electrical etc. Each of these departments will have a daily target. For most companies getting interim positions of how they are doing against that target involves individual till visits or trawling through a back office green screen or ERP type system. Flynet Dashboard Server takes a different approach we can see that data at any time and from any device, so a department manager can be on the shop floor, quickly take out his phone, tablet or laptop, connect securely to our the Flynet Dashboard Server via a web browser and see instantly how his team are doing, how other departments are doing and what he needs to do to either drive harder toward his own target or help other teams who are slipping against their targets. Drive faster decision making with unparalleled interactivity and what-if analysis. Provide IT and business users with direct connectivity to live data sources. Works with Flynet Viewer Studio WS to allow the creation of dashboards with data from your heritage systems, such as IBM Mainframe & iSeries, UNIX, VMS, MultiValue and Pick. Design inspirational business dashboards that can be deployed and adopted quickly. Mobilize your dashboards on iPads for anytime, anywhere insights. Build dashboards connected to real time data; allowing you to design the dashboards needed to better run the business. Connects to all OLEDB and ODBC data sources. Proven productivity benefits for business users and developers alike. No need to understand SQL. Create sophisticated, complex dashboards in a fraction of the time. Publish to flash and HTML to cover all device and browser types. Data surfaced from host and heritage systems using Flynet Viewer Studio WS can be included on your dashboards. Flynet Database Server connects to the following data sources. The Flynet Dashboard Server 'Full Experience' is supported for a large number of popular databases, and we're adding new ones all the time. When using a database that supports the Full Experience, you have access to our drag and drop query builder. This allows you to build simple and complex queries alike using a tile based editor. This editor hides the differences between underlying database syntax, and validates your query in real-time. The following graphical query components are supported. Flynet Dashboard Server also supports manual text SQL and write-back queries. Flynet Dashboard Server web services are of the following formats. XML SOAP for SAP BusinessObjects Query as a Web Service. Restful JSON (compatible with SAP Design Studio). Deploy dashboards to desktop, mobile and tablet devices. This hospitality dashboard enables executives to evaluate regional performace, resources, and customer satisfaction on a daily basis. The environment agency publish detailed statistics for each county in the UK. These are ideally presented using dashboards, where measurements and trends can be accessed visually using a map. Performance of individual sales reps can be monitored, and compared with targets. This dashboard breaks down operating costs and projections over six continents. This web statistics dashboard allows the user to project different scenarios dynamically, based on data already collected. For example, increasing the number of Internet enquiries will produce an increase in bandwidth costs. This dashboard shows how by adjusting values for a range of variables, different business scenarios can be forecasted. Annual sales stats for each region can be compared with those for competitors, along with growth projections and market presence.